For wine lovers . 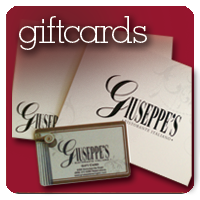 . .
A membership in the Giuseppe’s Wine Club is a great way to experience Giuseppe’s extensive wine list at special membership prices. Twenty percent off all in-stock bottles of wine every Friday and Saturday. Half price bottles of wine on the day of purchase of the wine club membership. Ask your server about a membership, or give us a call!